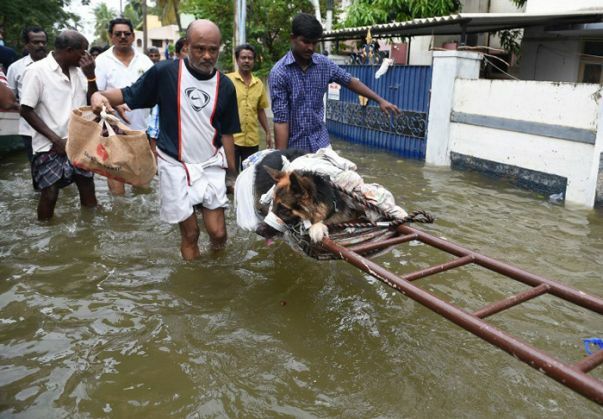 As Chennai flooded, people left behind houses, belongings and pets. Who's rescuing them? 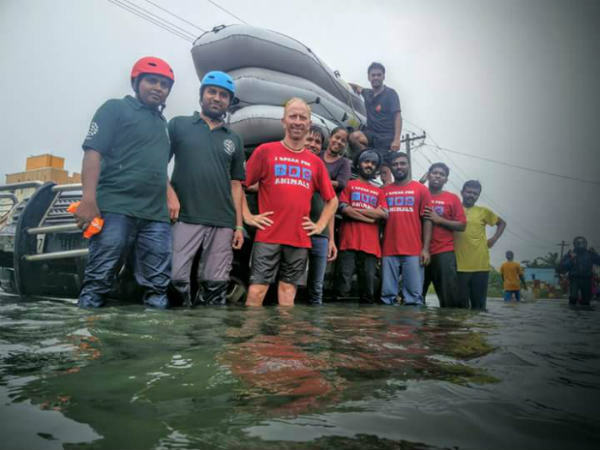 As rescue operations in Chennai remain difficult during this crucial time, a group of student volunteers are going around in a boat, rescuing not only people but stranded animals too. Catch spoke to Al Ameen, a student at the Asian College of Journalism and one of the volunteers in this group. "We started out as a group of four-five people but now our group has expanded to about 40 members. We have allotted areas to each other and keep track of the rescues." According to Ameen, they have managed to rescue more than 50 people and around 15-16 stray animals and pets in the city, not counting the cattle and other animals in the outskirts of Chennai. They are also distributing food packets to people in need. Ameen and his group are also volunteers at Blue Cross. "We go around in an ambulance, which is sort of just a truck. But the major roads are all blocked. Even the two-three main bridges in the city have become inaccessible. The situation here is getting worse every hour," he says. The group has bought a boat and when the water gets too high to use the truck, they conduct rescues via the boat. Harrowing visuals of people swimming in neck high waters are plastered all over news channels but Ameen talks about the often ignored side. "We have been to the outskirts of Chennai. People initially tied their cattle and other animals to say a tree or pole. And when the water started coming in, they fled. When we reached these places, we found the animals standing on a small patch of land, completely surrounded by water." They haven't seen a lot of stranded cattle inside the city yet, but they have been rescuing stray animals and pets who have been left behind by families who were forced to vacate their homes for higher ground. Ameen and his group of volunteers seek out people who are in need of help or rescue by using social media and hashtags like #ChennaiRains. "Seventy per cent of the time we are seeking out people who need help. We have even been contacted by people from other cities who cannot reach their kin in Chennai. But most of our phones are also dying because there has been no electricity. So people mostly contact us through social media." And with that, Ameen mentions that his phone only has about 17 per cent charge and he needs to leave for another rescue. Edit: This is a picture of the volunteers. Ameen was not able to send me pictures at the time of the interview as he and his team were busy tracking people and animals who needed to be rescued. Will Rajamouli's Baahubali 2 clash with Aamir Khan's Dangal during Christmas 2016? READ NEXT >> Will Rajamouli's Baahubali 2 clash with Aamir Khan's Dangal during Christmas 2016?